Ashton Kutcher was the first to one million, Lady Gaga was the first to 10, 20 and 30 million followers and Justin Bieber was the first to 40 million. 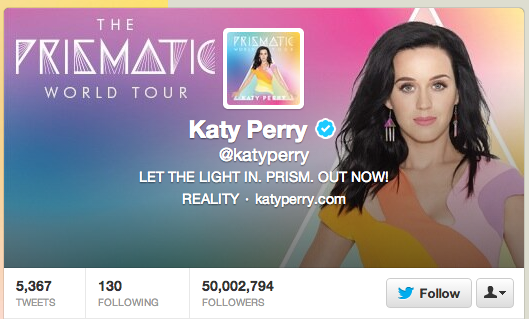 And now, music megastar Katy Perry becomes the first Twitter to user to reach an incredible 50 million followers. Perry’s always been popular on Twitter but her ascent really quickened in the tail-end of last year* which saw her leap-frog Bieber to become Twitter’s top user. Bieber’s rabid fans have kept him in touch and he may yet regain the lead, but as of right now he’s close to 800,000 behind. In other news, President Barack Obama recently swapped places with Lady Gaga to assume Twitter’s third place overall in the rankings. Gaga’s star has continued to fall since she lost Twitter’s top spot to Bieber, and if Twitter is an indication of anything, it’s that this may well reflect her career, too – I wouldn’t be surprised if both YouTube and Taylor Swift catch and pass her in Q1 of this year. * My guess as to why? Twitter CPC. Seriously.